Blake Fielder-Civil, Amy Winehouse’s former husband, was rushed into hospital two nights ago after suffering from multiple organ failure. And although he’s still in a coma, Blake Fielder-Civil’s girlfriend, Sarah Aspin, is continuing to keep a bedside vigil and is convinced he’s starting to make a slight improvement. Blake Fielder-Civil was put into a medically induced coma after being treated for multiple organ failure and remains on a life-support machine after an alleged drink and drugs binge. But Sarah Aspin, the mother of his 15-month-old son Jack, said she believed he was beginning to wake up in the hospital in Dewsbury, West Yorkshire. 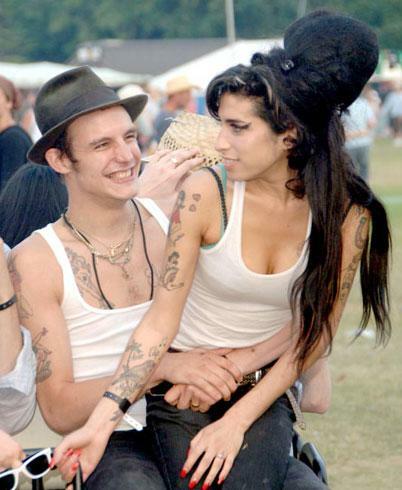 Blake Fielder-Civil, 30, who has long battled drug addiction, was found choking in bed by Sarah Aspin last Friday – just weeks after the first commemoration of Amy Winehouse’s death. Sarah Aspin, 34, who met him in rehab, said: “He needs to come out of this, if not for me or himself then for Jack. Jack is only young but knows something is wrong. “He has been calling for his dadda. I’m praying for him and would ask everybody to do the same. I know he is going to pull through – he keeps waking up. “I go down to the hospital every day – it’s heartbreaking to see Blake lying there. The doctors aren’t really giving us any indication of how he is doing. “He looks like he is getting there though, bit by bit. He hadn’t been taking heroin and he is not a big drinker so I think he may have been taking tablets and they don’t mix well with alcohol. “I just hope he realizes that he can’t do this anymore. He needs to think of Jack. This has got to be a wake-up call for him. Sarah Aspin revealed that the couple had discussed getting married last week – shortly before he staggered home after a drinking session and collapsed. She called paramedics, who said Blake Fielder-Civil had swallowed his tongue, choked on vomit and that his left lung was not working. Meanwhile, last night, Amy Winehouse’s father Mitch told the singer’s fans to pray for Blake Fielder-Civil, who was released from prison two weeks ago after being jailed in June last year for burglary and possession of an imitation firearm. Amy Winehouse met Blake Fielder-Civil, a music video assistant, in a pub in 2005. They married in 2007 before divorcing two years later. Amy Winehouse, who also struggled with drug addiction, was found dead on July 23 last year at her home in Camden, North London, aged just 27. A coroner found she was more than five times the drink-drive limit and ruled the singer’s death was the result of drinking too much alcohol. Blake Fielder-Civil, a recovering drug addict, had gone out drinking with a friend the previous day and Sarah Aspin said she believed he might have taken an illicit substance. The day before she was having to prepare herself “that he may never wake up”. Blake Fielder-Civil’s friend, Yeya Jáuregui, said yesterday that he was still in a coma and urged his fans to “keep on praying”.